You can select the metering point for reviewing. In the reporting service, you will see the metering points where you have a current contract with us or have had one in the past. The consumption data from the beginning of 2011 is displayed in the service. As the data is shown down to the hourly level, consumption data can only be viewed from the date when hourly metering was taken into use at your metering point. You can define the period to be reviewed by entering the dates in question and clicking the Search button. The period to be reviewed can also be defined in the diagram on the top of the page by highlighting the period with the mouse. The report shows a bar chart on the amount of consumption for different periods. When you click with the mouse over a bar you will see more detailed information for each individual bar. The Specify Here button will provide even more information about the bar in question. You can also select the required review accuracy (year, month, week, day, hour). Reactive power customers can see the consumption and production data for reactive power. The data can be viewed at the hourly level by clicking the Reactive Power button. 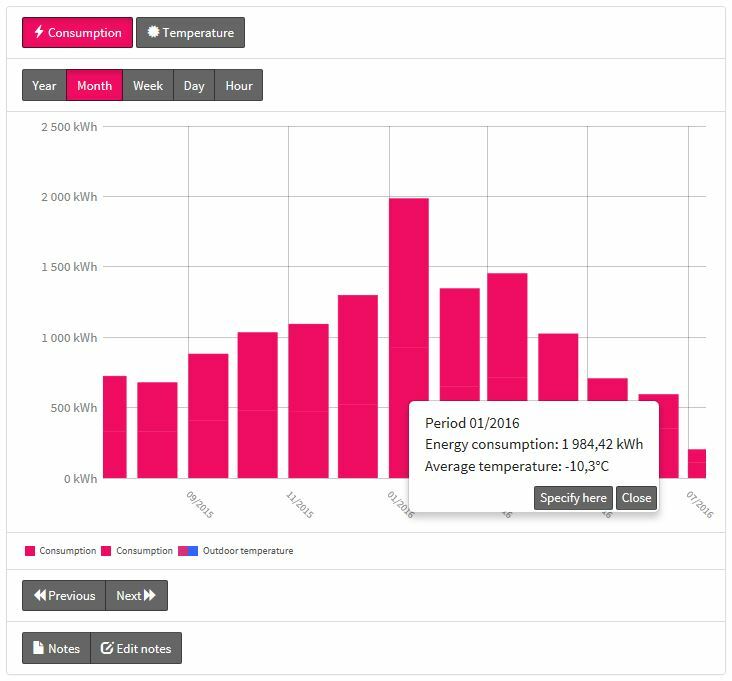 The outdoor temperature for the selected period can be viewed by clicking the Temperature button on the electricity and heat report. Move with the buttons to the previous or next period corresponding to your selected period. You can enter notes for the metering point. A new note is entered with the Edit button. You will get the summary data for the selected period and a comparison with the same period in the previous year. 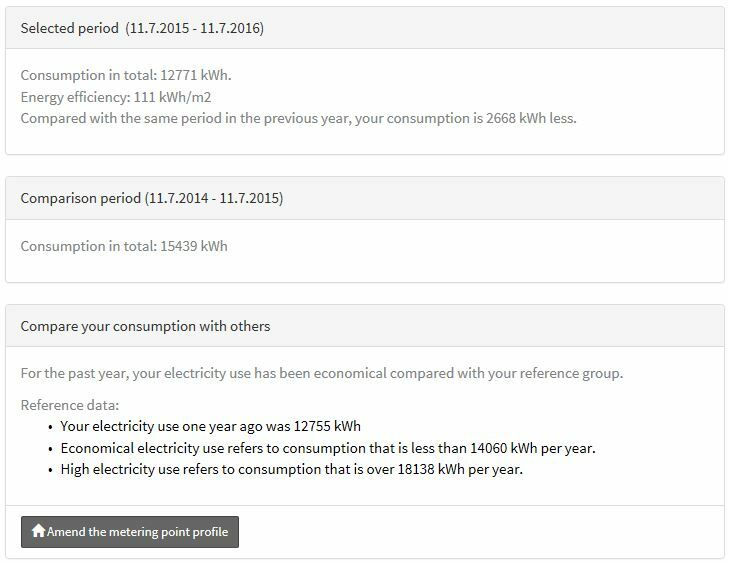 Energy efficiency means consumption divided by the square metres given in the profile information for the metering point. The comparison data is given in a verbal format. When you log in to the reporting service for the first time, you will be asked for additional information about the metering point for producing comparison data. If you do not give this information, the service will ask for it again the next time. By clicking the Full Information button, you will see all data for the selected period and review accuracy in a table format. You can also transfer this data to an Excel table. This view is not available in mobile view. You can order a weekly or monthly consumption report on electricity and district heat to your email. The message will show the consumption during the period of your order as total consumption. The reports are sent once we have received the consumption data for the reporting period. Weekly reports are normally sent on Tuesdays and monthly reports on the second day of the month. The report is free of charge.